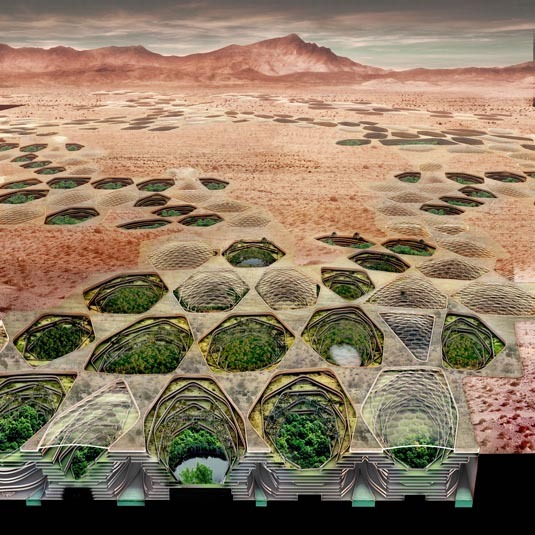 The rest of the project combines an interest in drought hydropolitics in the U.S. southwest with the speculative architecture of "underground water banks." Accordingly, Kudliss suggests that "waterbanking" will become "the fundamental factor in future urban infrastructure in the American Southwest." In this context, I would unhesitatingly recommend Marc Reisner's classic book Cadillac Desert – the first hydrological page-turner I've ever read – as well as James Lawrence Powell's recent Dead Pool: Lake Powell, Global Warming, and the Future of Water in the West (which I reviewed for The Wilson Quarterly earlier this year). Those two books are ideal references for Matsys's project, as they each supply countless examples of hubristic, quasi-imperial waterbanking projects – projects that might still be functioning today but that are doomed, the authors convincingly show, to eventual dehydration. 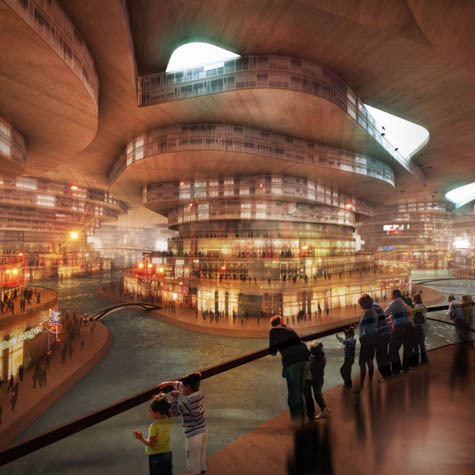 [Image: Matsys's Sietch Nevada as seen from above; renderings by Nenad Katic]. In any case, the proposal seen here is "an urban prototype," we read, "that makes the storage, use, and collection of water essential to the form and performance of urban life." Check out the full project on Matsys's own website – and, while you're there, the entire project database is worth a spin. This concept is very creative and perhaps even visionary. 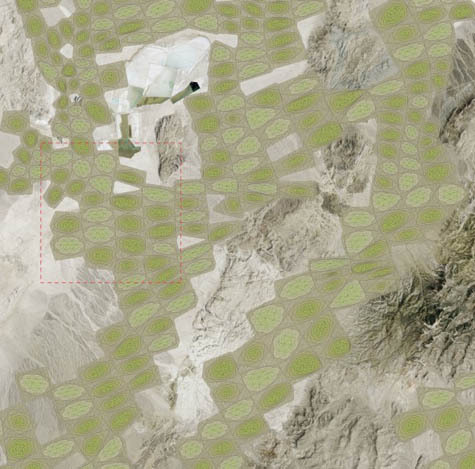 1) This is strip mining on a nearly unimaginable scale, removing (to where?) what looks like easily tens of square miles of earth to a depth of hundredths of feet without somehow fouling the precious aquifer Mr. Kudless hopes to access . What are the ecological repercussions of doing that? 2) Then, within that massive excavation you then need to construct whole cities along with their infrastructures underground and then seal them up. All of the above at what seems colossal costs. If the purpose of the domes is to prevent evaporation and create more humid microclimates, then why not just keep a version of the tap wells already being employed and build sealed (mega) structures on the surface? It seems the same results could be achieved at significant less costs and ecological disruption. True the cooling effects of living underground would not be realized, but it seems that could be offset by solar (which that region has in abundance) and wind power. I'm not attacking the concept, I'm just wondering if the plan as conceived is financially and ecologically the most efficient. So then, what if instead of mining downward or building on a flat surface, one were to take this design and build across a valley with it, essentially filling in an area? All theory of course. In this hypathetical, reuse the material of one city to build another. If we are to undertake one monumental project, we may as well make it 'greener' by not expanding urbanism and shrinking wilderness, but rather re-constructing what we already have.